Seven people have died in the powerful blast has ripped through a bus parked at Burgas airport on the Bulgarian Black Sea coast, carrying Israeli tourists, according to the Bulgarian National Television. Other media reports have so far suggested that the casualties were between three and five. Over 27 people were rushed to a Burgas hospital. Three are said to be in a critical condition. 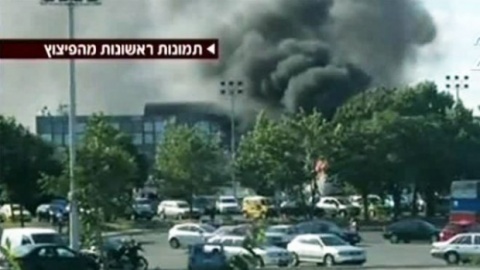 The site of the Burgas Airport says the Israeli tourists arrived on a flight of Air Via from Tel Aviv at 4:50 pm. After that, they got on a bus to reach Bulgaria's largest Black Sea resort Sunny Beach. According to reports, there were about 40 Israeli tourists on the bus. A total of three buses caught fire on the Burgas Airport parking lot. Witnesses told Israeli media that the deadly blast occurred soon after someone boarded the vehicle. The Interior Ministry says the blast was a terror attack.